Microsoft and EA are teaming up for some damn fine looking Xbox One S Battlefield 1 bundles as was first announced on the Xbox Wire this morning. 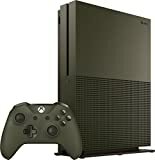 If you’re looking for the cheapest way to get an Xbox One S plus Battlefield 1, then there’s the standard 500GB Xbox One S Battlefield 1 Bundle for $299, and the very cool looking “Storm Grey Special Edition” version, which will also retail for $299 but will be exclusive to the Microsoft Store and Wal-Mart. These skus will be available October 21st and November 1st, respectively. Last but not least is the 1TB Xbox One S Battlefield 1 Special Edition Bundle that includes a slick looking military green console, matching stand and controller and a full-game download of Battlefield 1 Early Enlister Deluxe Edition for $349 and will launch on October 18th. Amazon already has a a couple of them available to pre-order, right here. Have a look at some product shots and the official details for each bundle.